Back in the summer of 2000, my then-fiancé Mr Minx and I took a trip to New Orleans with a group of people whom I had "met" via an Internet chat group. Emeril Lagasse was still climbing the peak of his popularity, and our gang of avid fans planned an excursion to dine in the city that made him famous. Originally a large group of 20 or more, squabbling between the individuals who each believed they were in charge of the party led to splinter factions. We ended up traveling with a bombastic woman named Lynne who claimed to have lived in the Big Easy for a time, and knew Emeril and his chefs personally. We initially trusted her authoritative nature but soon found out that she was a bit of a dictator. Show me a control freak, and I'll turn rebel right quick. After suffering through a slog around the French Quarter in the blistering heat and humidity, Mr Minx and I broke away and had lunch at NOLA, a restaurant that was not sanctioned by Dictator Lynne. We had possibly the best meal of our trip, parts of which we can still experience today if we're lucky enough to have a quart of Cajun Kate's gumbo in the freezer. 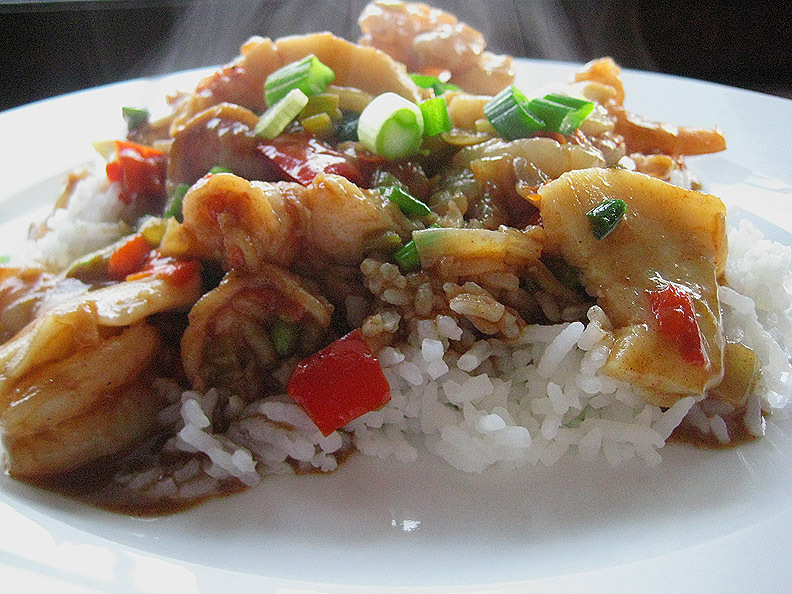 Apart from that meal, I subsisted largely on crawfish, which I had grown to love in the 90s. My closest friend back then had parents who hailed from Louisiana; there was always a stockpile of crawfish tails in their basement freezer. 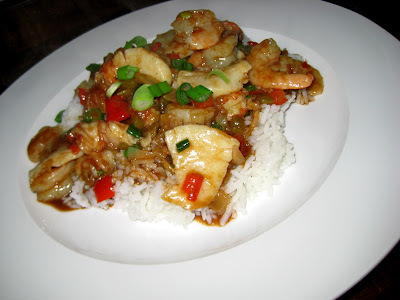 I love their funky, somewhat-lobstery flavor and texture and thrilled when we'd cook up a big pot of gumbo in the Walker's kitchen. On one occasion, the two of us prepared a rather ambitious multi-course meal to celebrate the upcoming nuptials of mutual friends; crawfish mousse served in a scallop shell and garnished with a whole mudbug served as the fish course. In New Orleans, I ate as many versions of crawfish etouffée as I could get my lips on, and a crawfish po' boy for good measure. 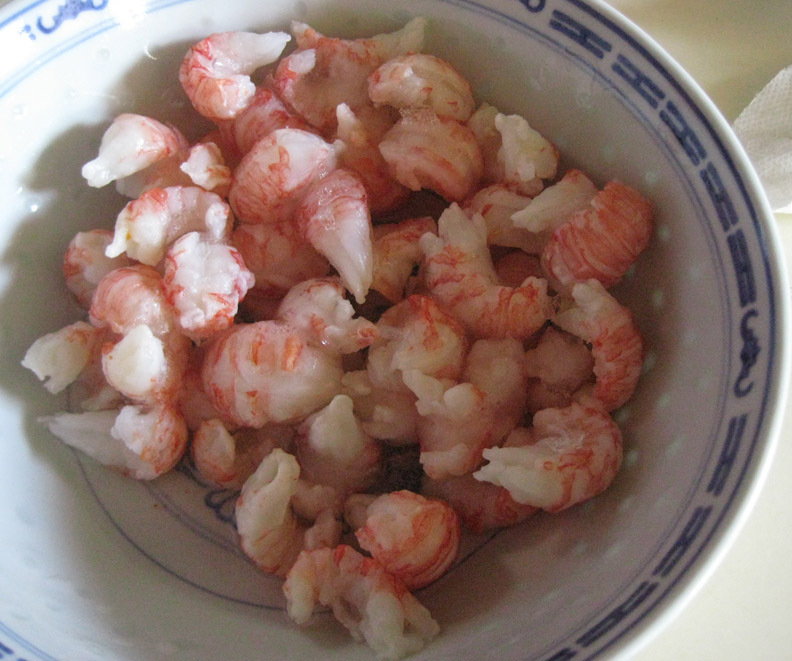 Like crawfish tails, but paler in color. Back in Baltimore, I found that it's near impossible to find crawfish, so when I have a hankering for etouffée, I usually have to settle for shrimp. 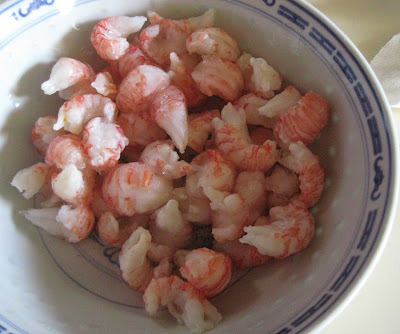 Trader Joe's sells frozen langoustine tails that are pretty similar to crawfish. Alone, or with the addition of other shellfish like shrimp or scallops, they make a terrific Shellfish Etouffée. Preheat oven to 450F. Line a small baking tray with aluminum foil and add the flour, distributed as evenly as possible. Toast flour in the oven for 15 - 20 minutes, checking and stirring every 5 minutes or so, until the flour is evenly browned and approximately the color of cocoa powder. Remove from heat and set aside. 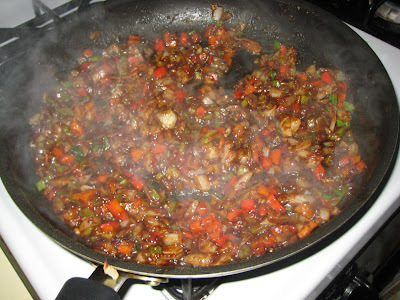 In a large saute pan, add butter and oil, heat on medium until butter is melted and has stopped foaming, 3-4 minutes. Slowly stir in toasted flour. 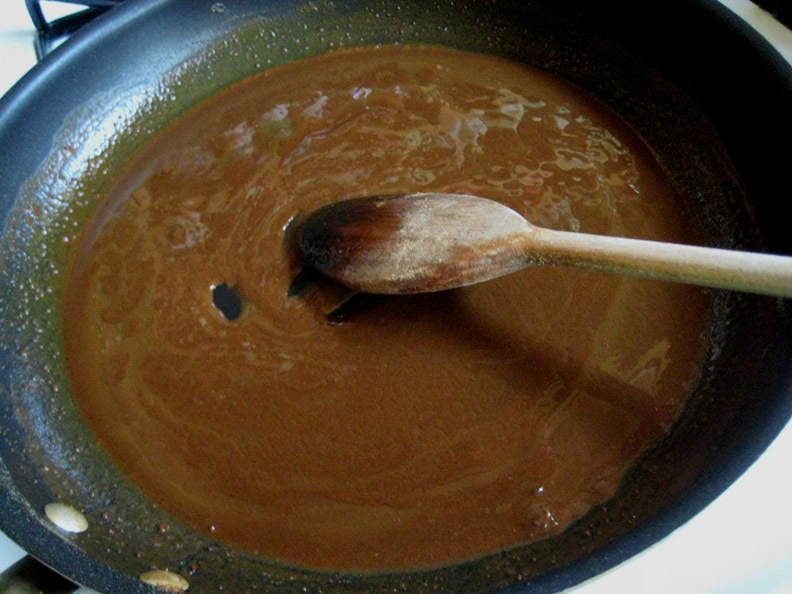 The roux should turn a deep chocolate brown almost instantaneously. (Yes, I know it's cheating, but who has 45 minutes to stir roux?) Cook roux over medium heat, stirring constantly, for about 15 minutes. 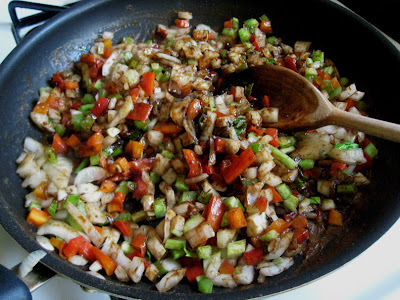 Add vegetables to hot roux and cook, stirring occasionally, until the vegetables soften, about 10 minutes. chopped "trinity" hitting smoking hot roux. Heaven! Turn heat to low, add the seasonings and stock, and cook for about thirty minutes. Add shellfish, butter, and scallions, and cook an additional 10 minutes or so, until shrimp are opaque and other shellfish are heated through. Taste and adjust seasonings if necessary, adding salt, pepper, more hot sauce, and maybe a squeeze of lemon, if desired. Serve over hot rice. Serves 2-4. Your recipe looks delicious, and considerably more healthy then the ones I have used, which require Paula Deenish amounts of butter! I'll have to try your roux trick, too. My Momma used to make hers in the mocrowave, but I'm a bit more of a purist. If you cook it hot enough it doesn't take that long, but you have to stir enough to prevent burning! And I must add langoutines to my list, although alas the 4th largest city in America has no Trader Joes!